Did you know how easy it is to create your own findings? Once you master that skill, you'll find it difficult to buy them ready made! 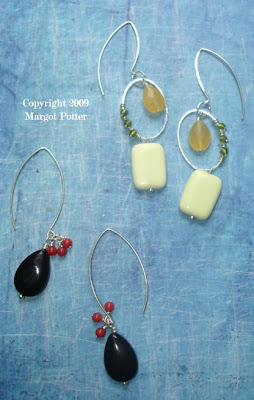 This project from my new book Bead Chic shows you how to create some longer bent and curved ear wires. You can opt to use base metal instead of sterling, but definitely use a 20 gauge wire made from stainless or another more sturdy metal and make sure you sand or use a wire rounder on the ends. I used a rat tail comb to create the sharp bend...I'm of the mind that you use what you have at hand! I called this design 'Effortless Elegance' because it's just a few lovely beads and an artfully bent wire. This is from the chapter on Pattern and the variation is a little more complex with some hammering of the front part of the ear wire and some simple wire wrapping on a QuickLinks component. You could wrap beads on the front part of the ear wire...or add coiled wire...or add a bead or two...see how this keeps shifting if you make small changes? That's what this book is all about! You'll need to buy the book to get the step by step photos. If you leave a comment here, I will select one of you to win a signed copy of the new book and a bonus swag sample. I'll announce the winner next Saturday August 28th. 1. Cut off two 3” segments of wire. 2. Bend wire over a thin dowel to create a crease or point, this should be not quite in the center of the wire and in the same spot on both wires. 3. Gently round both wire tails into a matching curve. 4. Sand ends of wire. 5. Bend a loop in one end of wire using round nose pliers. 6. 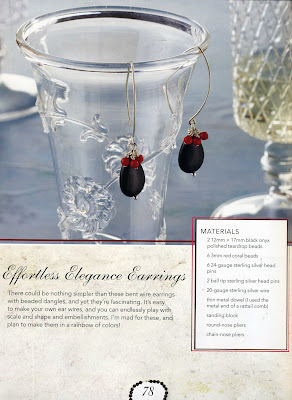 Create wrapped dangles using ball tip head pins and onyx beads. Repeat for coral beads using regular head pins. 7. Attach beads to loop at end of ear wire onyx first followed by three coral beads. Use chain nose pliers to open and close loop. I really like these, love how simple, yet they would look perfect with a cocktail dress! Margot- great stuff! Thanks for the freebie and I would LOVE to win a signed book! Thanks so much! Thanks for this great giveaway & freebie! I've never worked with wire before, but I think I could do this easily. I have question, though. I did an online search for 20g sterling silver wire and am a little confused. I've gathered that "dead soft" means that the wire is extremely flexible. Is that the kind of wire I would want to purchase to make something like this? Or is ahrd wire what I would be looking for? Oh my gosh, these are gorgeous! They're so simple yet elegant. Not that I have much occasion to dress up, but who says you can't wear such lovely earrings with everyday clothes? Would certainly add some sparkle. Oooh, I've been drooling over your book since before it was released... I would love to win a copy!! Otherwise, I have to wait until my financial aid is disbursed, but I can barely contain myself! I love these earrings -- you are right, so simple yet so elegant! Endless combinations, Miss Madge! I have wanted to make my own ear wires for some time. Even bought one of those wire jig thingamabobs. Haven't found the time to experiment yet. But I think you have just inspired me. 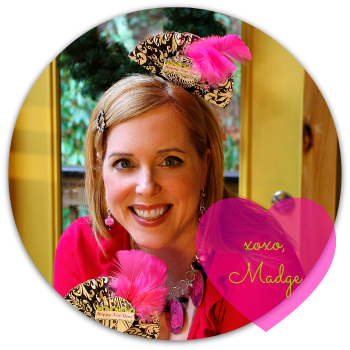 I would LOVE to win your book (the other Madge books on the shelf are lonely!) Enjoy the day! Dead soft or half hard would work. Love your instructions! Blog looks awesome also!! I love the way our world connects... from Facebook, trying to make a 'badge' for my 'painting with watercolors' page/like .. mam-o-man/gal! ... am I a novice! ...found YOU! found these lovely earings, found other interesting people/places... never did figure out how to create a badge, or really, why I'd want to... but I now want to create these earings! those are so cute. great ideas! Thank you for the great giveaway and freebie! As I am currently saving up for this book, I would love to win a copy! So many thing can be made by bent wire, And I love your comment. What a great concept. Simple but elegant. I am so impressed. Yours is a must have book for my library. Thanks for the free patterns too. All the seniors in my jewelry making group are chattering away about how great they are. Cool! I really wanted some like this- was looking to order some... now I will make my own!! I love the way the wear! I love this concept. Thanks so much for sharing!! Those earrings are very classy. Very elegant - thank you for the free directions and the chance to win! these are lovely! So simple and elegant! Wow that book sounds amazing, I am adding it to my wishlist in case I don't win. These are great and look really simple to make. Thanks for all your easy designs. Every design I have seen from this book just makes me want it more. I would go over to Amazon on payday but I promise the DH no more shopping until after we move. But I can sure put my name in the drawing..
"But honey I didn't buy it"
They are lovely earring and I really like the idea of making my own findings. They look so strikingly simple. I would absolutely love to win your book. Thank you so much for sharing how to do the findings - these are beautiful!! Both versions are gorgeous...but I luuuve the black ones especially. Thanks for making the earwires look easy to do - I hardly ever think to make my own, but I totally should! Love the simple elegance of these earrings! I've linked to your tutorial and Jean Yates' review of Bead Chic. Best regards!